Event Countdown Wall Clock Counts Days to Your Special Day! The CK-5000 is a GREAT way to generate interest and excitement about an upcoming project or special event! Its highly attractive and dynamic LED display is fabulous for motivating sales, setting goals, completing projects on time, new product launches, or counting down to any Special Day! There's really nothing else quite like a large countdown wall clock to keep you on track to meet an important goal or deadline. Large, Eye Catching, Bright, and Highly Readable LED Digital Display shows Days, Hours, Minutes, Seconds, and tenths of Seconds. It's very eye catching and gets attention! Lower sign panel area below clock display can hold a removable customized panel for YOUR SPECIAL EVENT! Top sign panel area can also hold a removable panel as well. Easy to Set - Enter the current date & time, then the date & time in the future to count down to. Size: 23.25 Wide x 17.75 High x 1.75 Deep (Inches). See photo diagram below for further details. UL Listed Plug In Wall Adapter included. This clock is not battery operated. For Indoor Use Only. Great for motivating sales, goal setting, completing your projects on time, new product launches, sales contests, incentive programs, or counting down to Any Special Day! 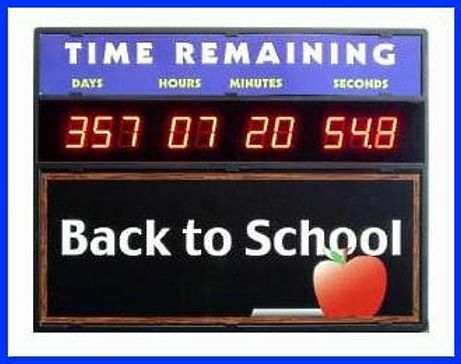 This is a unique countdown wall clock, and looks great in offices, schools, churches, government buildings, etc... It can motivate people and generate excitement about a future important day. OUT OF STOCK until about May 15, 2019. EXPEDITED AIR SHIPPING IS NOT AVAILABLE. Sorry, absolutely NO EXCEPTIONS. IMPORTANT NOTE - PLEASE READ! The sign panel areas above and below the LED display can hold panels for your special day in the future! The clock is a one piece molded plastic case, with slots built in for holding the panels. The panels simply slide into these slots. Card stock type material would be suitable for use as panels. WE DO NOT MAKE PANELS. IT SHIPS WITHOUT THE TOP & LOWER PANELS. YOU SUPPLY YOUR OWN PANELS. Companies which offer graphic arts services, national brand office supply stores, and sign businesses offer this capability and service. Also, many larger companies and organizations have in house graphic arts departments which are most likely capable of producing custom panels. See our template drawings below to use as a guideline. You may print a PDF SHEET or a GIF IMAGE of the panel layout. CK-6 Day Countdown or Count Up Timer : Small desk timer, with DAYS, Hours, & Minutes. CK-6000 Count Down or Count Up Timer with Days : Large display, and compact size.